U.S. Navy coastal patrol ship fires three warning shots at an Iranian ship in the Northern Persian Gulf. A U.S. Navy coastal patrol ship fired three warning shots at an Iranian ship that sailed within 200 yards in the Northern Persian Gulf Wednesday, a U.S. official confirmed to Fox News on Thursday. The incident is one of four close calls this week involving U.S. and Iranian vessels, according to Fox News. Other close calls this week involved the USS Tempest and USS Stout, Pentagon Press Secretary Peter Cook told reporters Thursday. The Pentagon described the incidents as "unsafe and unprofessional." U.S. Navy video of the Nitze incident showed American sailor firing flares and sounding the warship's horn as the Iranian boats approached. The official told Fox News the Nitze was ultimately forced to change its course to avoid the Iranian ships, despite coming close to offshore oil rigs. This week’s incidents are not the first time that Americans and Iranians have clashed in the Persian Gulf. In January, Washington said Iran launched rockets near an American aircraft carrier in the Persian Gulf. While Iran initially denied doing so, footage was later released that proved it had indeed fired on the American carrier. Later that month, Iranian media claimed the country flew a surveillance drone over an American aircraft carrier in the Persian Gulf and took "precise" photographs of it as part of an ongoing naval drill. In January, Iran infamously briefly detained 10 U.S. Navy sailors who mistakenly steered into Iranian waters. 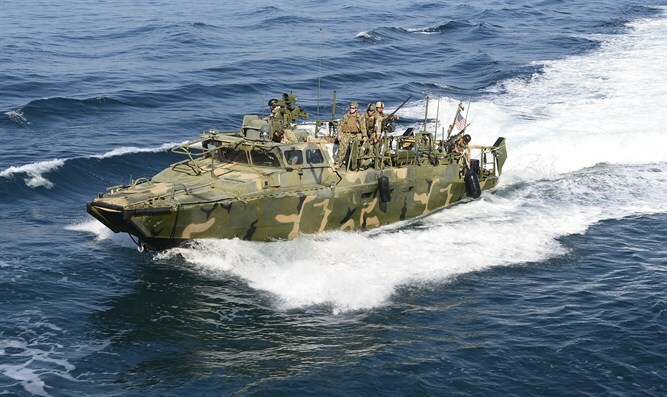 U.S. Adm. John Richardson said on Thursday that the incident involving the Nitze reflected the greater competition the U.S. was facing at sea and underscored the naval tensions with Tehran, which include other similar incidents. Iran's semi-official Tasnim news agency quoted Gen. Hosein Dehghan as saying Thursday that "if any foreign vessel enters our waters, we warn them, and if it's an invasion, we confront." He added that Iranian boats patrol to monitor traffic and foreign vessels in its territorial waters.